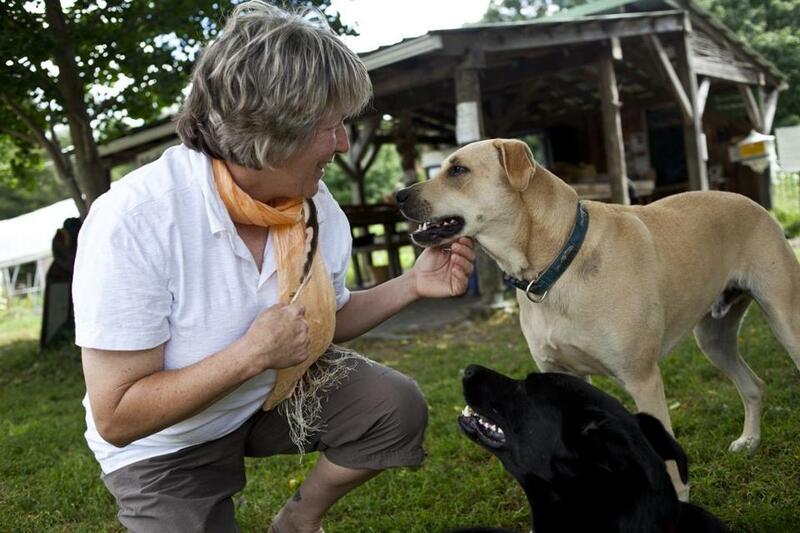 Two farm dogs greet Janet Kennedy at the Natick Community Farm on Aug. 29 in Natick. NATICK — To the casual observer, Janet Kennedy sitting on her haunches and whispering to a puppy at the Natick Community Organic Farm suggested nothing more than Kennedy’s friendliness with animals. But Kennedy wasn’t just making nice. She was giving the 5-month-old Australian cattle dog a “reading” at the behest of the farm’s managers. The Framingham resident is an animal whisperer — a spiritual communicator and medium who “talks” with all sorts of animals, living and dead, and helps them communicate with their human owners. “I guess you could say I’m a real-life Dr. Doolittle,” she says. Kennedy, 54, isn’t only and wasn’t always a medium — a word she much prefers to “psychic,” since she doesn’t read minds but rather communicates with animals. For 24 years she worked at Framingham High School as an athletic trainer and, in her final two years, a physical education teacher. What she calls her “spiritual journey” began in 1980 when she was 20 and working as a counselor at a summer camp in Maine. The experience was the start of Kennedy’s awakening. She says she immediately noticed she was more aware of life around her, and even felt connected to it more deeply than ever. Several years later, she was drawn to a spiritualist church that encouraged revering nature rather than a single deity. One by one, friends told neighbors who told their friends and colleagues, and Kennedy began to build a following. There were farmers and equestrian enthusiasts, average pet owners, even wild animals that were owned by no one. Still, in spite of the enthusiasm, Kennedy occasionally encounters skeptics or people who are simply creeped out by her abilities. She charges $75 for a one-hour session. And as unusual as her work may be, she’s in a busy field. 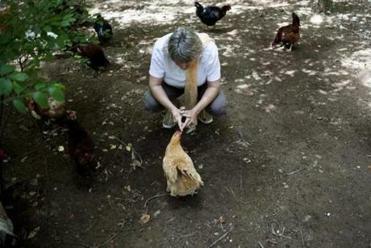 Janet Kennedy communicates with a chicken at the Natick Community Farm. In Massachusetts alone, there are 11 professional animal communicators, all of whom charge roughly the same for their services. And while there is no comprehensive national directory, several popular online forums have overlapping lists of more than 200 established animal communicators, including more than 50 in California. Deren, a psychic for humans who also works with animals, says that if there’s a common concern among her four-legged clients, it’s that their owners aren’t paying attention to the obvious signals that they’re unhappy. Nancy Powell, a legal assistant at Mintz Levin, a major law firm in Boston, is a longtime client of Kennedy’s. Back at Natick Community Organic Farm, Jon Young, the farm’s summer programs coordinator, also swears by Kennedy. His pet Queenie was the cattle dog Kennedy was communicating with that Friday. Per Kennedy’s rules, Young didn’t reveal any details to her about Queenie’s problematic behavior. But after her session with Queenie, in a fenced-in pen that houses a chicken coop, Kennedy told Young that Queenie wanted him to be more patient with her while she adjusted to life on the farm. She also wanted porcelain food and water bowls. Young’s response? He recalled that Queenie had been acting a bit skittish in certain areas of the farm, and Kennedy figured out that the dog was frightened of spring-loaded gates that she thought would slam shut on her as she ran through them. And as for the bowls, Young said Queenie had been tipping over her water bowl and then walking around with the empty bowl in her mouth and a frustrated look on her face. James H. Burnett III can be reached at james.burnett@ globe.com. Follow him on Twitter @JamesBurnett.